Finding the suitable gift for a correct person can be tricky. When in doubt, give Chocolate it is affordable and practically guaranteed to put a smile on someone’s face. For people who like wafers and Chocolate , here is an excellent treat from Nestle. The Nestle Kit Kat Chunky Chocolate is loved by kids and adults world over. The wafer in this Chocolate bar is fully covered with milk Chocolate , giving the entire package a nourishing taste. It is a delightful experience to eat wafers and Chocolate together.Need a way to show that special person how much you care. Confess your love in style through Giftalove with this extra special surprise. This mesmerizing heart shaped Chocolate arrangement is an ideal way to impress that special person in your life. This is a Mouth-watering gift item for those who love crisp wafers in Chocolates. 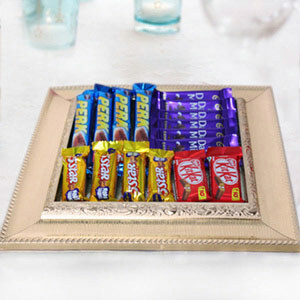 Deliver your love to your dear ones in the form of this splendid KITKAT Chocolate arrangement. It has a unique finger format with a breaking ritual attached to it. Heart shaped KitKat Chocolate Bars Cake with Homemade Chocolate hearts arrange on the top for Icing filling (Weight : 475 Gms). Surprised my little brother with this chocolate cake. I am satisfied with the purchase as it was delivered to me on time which was right on my bro's birthday. No complaints!